A business model is a way in which organizations capture value. Not only the economic value but also the social values an organization can foster and the cultural values it can sustain in the long run. In other words, generating a business model isn’t just about how companies make money but how they create value for several players. Unlocking profits for the organization that came up with that business model is one of the critical elements. There isn’t a single way to design and assess a business model. However, the business model canvas is a holistic model that takes into account nine factors or building blocks. Alexander Osterwalder proposed the Business Model Canvas. He’s a Swiss business theorist that in 2000 together with a team of 470 co-creators in an attempt to create a tool that entrepreneurs could use for their businesses. The aim of having a sharp understanding of your business model is critical to provide strategic insights about your customers, product/service, and financial structure. Thus, to take action and iterate the business model until it unlocks value for your organization as a whole. Let’s take a real case study. I often mentioned the Google business model as a great example. You might like or not the giant from Mountain View. Yet what made this company so profitable – I argue – was its ability to unlock value for several players in the digital marketing space. In fact, on the one hand, with AdWords, Google allowed businesses to transparently bid on keywords based on the clicks those ads received. This allowed companies to disintermediate advertising from intermediaries that were taking up most of the margins (of course now Google gets them). On the other hand, with AdSense, Google allowed small publishers around the world to monetize their content. All they needed was an AdSense account and enough traffic to start earning money. Of course, as of today, this model isn’t sustainable anymore for many businesses. In a way, AdSense democratized the ads revenues, which before were only taken by large players. With Google, those profits got shared with content creators. Also, Google offered the best search experience compared to any other search engine. Even though it wasn’t the first to take over the market (it was actually among the last movers) Google offered a free service that worked wonders. The focus on a great search experience was one the most crucial factor in Google‘s success. Little critical note: Just like professors study birds flight and go around the world to teach birds how to fly while they can’t. So entrepreneurs that tinker on a daily basis with business models might have a better feel for that compared to theorists trying to teach them what a business model is. In short, my point is that you don’t need to get bogged down on its definition or to stick with the business model canvas to assess your business model. You might want to develop your way to look at your business as – if you’re an entrepreneur – there’s none better than you to do that. In short, use the business model canvas as one of the many methods you can use to assess your business. Don’t let professors or theorists tell you that is the only way. It’s not. At the end of this guide, we’ll see a few alternative tools you can use to assess, and design your business model. Going back to the business model canvas Alexander Osterwalder, outlined several prescriptions which form the building blocks for a business model. Those building blocks enable entrepreneurs to focus on operational, strategic, and financial assessments of their business. The nine building blocks of the business model canvas comprise vital partners, key activities, value propositions, customer relationships, customer segments, critical resources, channels, cost structure, and revenue streams. It all begins with your partners. If you don’t have the right partnerships in place, you don’t have a business at all. That is the starting point of your business model. Finding the right partners is critical. The success of your business and the traction depend upon your ability to identify and offer your partners a compelling reason to do business with you. For instance, if you think about Google, the principal partners are the small publishers part of the AdSense program, together to the businesses that are part of the AdWords network and the users that daily keep going back to the Google search box by giving it critical data to sustain its business model. If you think about Uber instead, you’ll notice how the key partners are its drivers for which Uber means an additional if not a full-time income as self-employed. Its engineers that keep the platform smooth and running and people that sustain the cause of Uber. If you think instead at Airbnb, you’ll notice that those key partners aren’t only hosts and travelers that transact each day on the platform. Also, freelance photographers that travel the world to take professional pictures that enrich the user experience of Airbnb are also key players. When it comes to partners “who” and “why” are critical questions. In short, who’s the niche of people that can sustain your business? And why, so what compelling reason are you giving them? What value do they get from this partnership? It doesn’t have to be just in terms of finances. Of course, initially, a better deal would do. But it could also be about social values or personal values. For instance, initially for its drivers, Uber didn’t mean right away full-time income. But it also meant more freedom for its drivers to work when they wanted. So initially freedom might have been a critical aspect. In short, those are the activities needed to make your value proposition compelling for your key partners. Thus, they can vary from removing friction (think of a marketplace that is hard to use), add features or make transactions smooth. In short, the more your organization acts as an enabler of business relationships among several players the more its value proposition consolidates. Thus, anything that solves a customer problem, or satisfies an unfulfilled need would do. The Q&A social network can bring together several partners (users, writers, top writers, publishers/online businesses, and investors) with different value propositions; all met on the same platform. Although the value proposition is not listed as the first element. In reality, this is the first thing you should assess. I’d say this is the foundation of your business model. That is what keeps the blocks together. Without knowing the core values for your customers or partners and what needs you’re satisfying, or what problems you’re solving for them you might have a product but not a business. This is connected with the previous building blocks and with the next ones. This is the glue that keeps it all together. As explained in the last point a value proposition doesn’t have to be for only one player, partner or type of customer. The value proposition isn’t marked in the stone, but it can change over time. As new partners join; and as you tinker with your business model and as new unforeseen needs come about your value proposition might also change. Based on the identified partners and customers you need to assess how to manage those relationships to keep them aligned with their expectations and within your business model. If you take Uber, as specified by innovationtactics.com it needs to consider four elements to manage their customer relationships. Each of those relationships will have different dynamics. For instance, drivers might be concerned about safety risks while regulators might be worried about transparency and proper data management. Another example, if you take the Airbnb business model, hosts are critical to the success of the platform, and concerns like liability coverages are essential for them to keep using it. That is why hosts are provided with insurance and liability coverage, the “Host Protection Coverage” (of course that might have happened because of some accidents). Once you have the previous building blocks in place, it shouldn’t be hard to define for which class of people you’re creating value and what are your most important customers. It is important to stress that although this is a list of blocks, it is not necessarily meant to be read or assessed in order. In fact, at times you might have some blocks but miss others. For instance, let’s take the case of a startup that has created an innovative software based on new, emerging technologies. The startup founders might know for sure that technology is valuable and it will open up market opportunities. Yet that same founder might not have a clue about who the potential customers might be. This shouldn’t surprise you. Starting up a business doesn’t necessarily mean to start from a problem people have. That is true in more traditional industries. In tech, the opposite might apply. You have new technology and a product that does many things. However, you struggle to have that business take off. How to find your customers? Often they will come to you as the interactions with the first customers become more intense. You’ll also refine your service to make it more focused on specific features and needs. That process of iteration will bring you to the so-called “product-market fit.” This process can be at times painful and time-consuming. As we’ve seen the value proposition is the glue that keeps all the blocks of your business model together. Thus, it is critical to assess what financial and human resources to allocate to allow your value proposition to keep your business model going. For instance, on Airbnb, it is critical to continue growing the offering and the quality of it to give more and more options to travelers. Also, Airbnb has noticed users wanted more experiences. It started to offer a whole new section focused on those experiences. A Peter Thiel might say if you don’t have a distribution you don’t have a product. As engineers are running many successful tech companies, it’s easy to get deluded by the fact that engineering alone can generate a successful business model. This is false! The business world is a competitive environment. It doesn’t matter if you’re technically skilled if you don’t have the guts to take action in critical moments your business might well sink with your technical skills. If you take Bring and Page, Google‘s founders, they are engineers, but they are businessmen. When Google paid $300 million for keeping its search engine as default choice within Mozilla, when Microsoft was about to steal it, it was an aggressive move to keep one of the most important distribution channels (at the time). Microsoft was trying to have Bing featured as default choice of Mozilla. When Google’s founders understood what was happening, they didn’t stop thinking for a second. They didn’t build algorithms to make that decision. They acted out of their guts feelings. If I had to name what’s the most important asset of any company, the distribution would come first. Finding the distribution channels that best fit your business isn’t a natural process. Traditional channels are word of mouth, paid marketing and media coverage. In the digital business world instead, there are channels like SEO, social media and content marketing. I know you might look at them as marketing tactics and they are. However, those are meant to build distribution channels. For instance, content can be used as a way to connect with key players in your industry that you’d want to have as business partners. Google can also act as a “distributor” as with a proper SEO strategy can bring a continuous stream of qualified traffic to enhance your business and so on. Gabriel Weinberg, the author of “Traction” and founder of DuckDuckGo, a search engine that doesn’t track you, has identified 19 channels you can tap into to grow your business. In the business community often growth is confused for profitability. That is not the case. Many companies that achieved staggering growth rates have failed to be profitable. This isn’t necessarily bad, but a successful long-term business needs to become profitable as soon as possible. When Google opened its hood in 2004 after its IPO, the numbers were staggering. In terms of growth, revenues, and profitability. A cost structure is then crucial to allow sustainable long-term growth. Generally speaking, your customer acquisition cost has to be lower than the lifetime value of your customers. Easy said than done. This connects us to the next, critical building block, the revenue stream generation. Until you don’t have a stream of revenues coming in you can’t say you have a business. This might seem a trivial point. Yet the way you monetize the company will also affect the overall business model. There isn’t a single way to generate revenues. You might choose a subscription business model, a freemium, a fee or membership model. That also depends upon the industry, product, and service you offer. For instance, Facebook uses a hidden revenue generation model. In short, the utterly free platform in a way “hides” to its users the way it monetizes. Of course, businesspeople and marketers are well aware of how Facebook makes money as it has been so far a proper advertising channel for many businesses. However, the average user doesn’t have a clue. Things are changing now that privacy issues and new regulations have brought attention to the Facebook, business model. Yet for a decade Facebook has benefited from a vast stream of revenues and high profitability without most users ever noticing it. Many might argue that the hidden revenue generation model is the most powerful. And in fact, it has proved so (Google is another example). Indeed, as Peter Thiel remarks in his book, Zero to One, sales works best when hidden. As none likes to be reminded of being sold something. However, a business model that works, in the long run, needs to be aligned with users’ interests. What more? Once you’ve found a revenue stream the works and is in line with your business model you can’t stop there. You need to keep experimenting with new revenue models. In short, the business model canvas is the starting point for your business, rather than the ending point of your entrepreneurial journey. So far we’ve seen how a business model canvas is a framework to design a company’s business model. At the same time that can be used as a tool to dissect, understand others’ companies business models and how they are positioned in the marketplace. 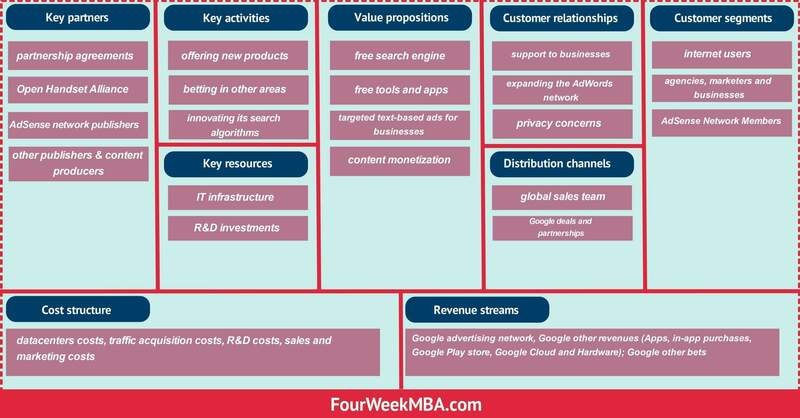 In this article, we’ll look at the Google business model canvas. Keep in mind that the business model canvas is just one of the frameworks you can use to build, design or assess a business model. Also, a business model canvas will capture where a company is or where it will want to be in the future. Thus, we’ll look at where Google business is at the time of this writing. While a business model does create a long-term competitive advantage, being able to innovate it over time is critical. If Google itself doesn’t want to be disrupted, it will need to evolve its business model. This might imply a complete change in a few years on a few things that comprise its business model according to the business model canvas like key partners, distribution channels and customer relationships. While the vision of a company might stay the same, other things like value proposition might change substantially. Each day billions of people get online, and they “google things up.” For many of those people, Google is de facto the web. Yet it hasn’t always been this way. There was a time, back in the late 1990s when the web was called AOL. Indeed, probably more than half of the traffic on the internet went through this portal. When Google launched, while it had figured a great product and search engine, it didn’t have a business model yet. In the paper, they pointed out their “mixed feelings” about the advertising business model. As they believed any search engine based on the premise of advertising in a way went against its primary mission. However, over time Google figured a way to show advertising in a way that would not affect user experience. Since the beginning traffic going through Google’s digital properties (its search pages) has been a critical ingredient for its long term success. That is also why initially Google made a deal with AOL to be featured as a primary search engine on its portal, which gave it massive visibility. AOL on its hand was offered such a good deal, and it also saw search as a secondary feature, that it couldn’t say no to Google. Therefore, while we give for granted the billions of queries – that each day – go through Google. We miss the fact that Google had to build up a vast distribution network that each day guarantees it this traffic. This isn’t a simple network, but rather a massive infrastructure worth billions of dollars each year. One example is the multi-billion dollar deal with Apple to have Google featured as a default search engine on Safari. Traffic doesn’t come from thin air; it comes from physical devices. As the web has shifted from desktop to mobile devices, Google has developed its distribution strategy (for instance via Google Chrome). However, a vast array of devices (take iPhones or iPads) are operated by Apple IOS operating system and its internet browser (Safari). To be featured on those devices Google pays a substantial amount of money. As pointed out above mobile users have grown massively in the last decade. This implies that whoever takes hold of the mobile content consumption can build a sustainable business model for years to come. With other 84 technology and mobile companies, Google forged the Open Handset Alliance. In fact, in 2005, Google acquired Android (what would become the prevailing operating system for mobile). The business model behind the Open Handset Alliance is a simple one. Google provides its free of charge, the operating system for mobile devices, Android, and in exchange for many apps, like Google Play and Google Chrome come pre-installed. It wasn’t just traffic the critical ingredient for Google success. It could offer relevant and high-quality content compared to any other portal, or search engine. On the one hand, Google had figured out how to offer relevant ads by introducing AdWords with its quality score. On the other hand, it needed to balance that with high-quality organic content from the web. While Google did offer that by indexing the entire visible web, it managed to improve quite a lot when it offered to any publishers (independently from their brand) the possibility to monetize their content via the AdSense network. Comprising millions of websites around the world; those websites allow Google to tap into their sites to place banners from businesses that want to advertise their services. Google shares the advertising revenues generated from those banners with these publishers. A great payoff of Google is its ability to send qualified traffic to any site, based on searches people perform. For instance, if I search for “car insurance” on Google, I will find a few text-based ads on top of its search results. At the same time, I’ll also find may other organic results, that didn’t pay a dime to be featured there. This is possible because Google has a massive index of the web, and if that content is relevant, it will be featured on Google’s first page. Being on Google’s first page might turn in substantial income for those sites able to rank through it. In particular, web owners can submit their website via Google Search Console (a platform to monitor the indexing of a site) to control how Google sees the site. This allows publishers – independently from being part of Google AdSense – to “control” their rankings vis Google organic search engine. Millions of webmasters each day help Google index their content, and make it easier for the search engine to keep a qualified index of the web! This bold vision requires Google keeps innovating in the search industry, while it also looks forward to new ways the web is developing. From voice search, visual search, machine learning and more. At a basic level, Google has to keep innovating its search algorithms. This alone requires substantial investments. As voice search is growing it is critical that Google keeps innovating by also offering new products. For instance, Google launched its new voice devices, such as Google Home, which compete against other tech giants, like Amazon‘s Alexa and Cortana. Google still generated most of its revenues from advertising. A business model based on a single source of revenue might not be sustainable in the long run. That is also why Google is investing resources in betting in other areas that might lead to the next innovation. For a tech giant like Google, which has a sophisticated business model, based on a hidden revenue generation, there isn’t a single value proposition. Free search engine for billions of users around the world. This is how Google managed to grow quickly. A great, reliable and free service that allowed users anywhere in the world to find the information they needed, fast. Besides its free search engine, Google also offers a set of free tools and apps (to mention a few: Gmail, Google Analytics, Blogger, Google Books, Google Chrome and many others). Those free tools are among the most used in the business world. The core of the Google business model is advertising, focused on targeted text-based ads for businesses offered via the AdSense network. Before Google existed,d there was no way for marketers to know in details all the conversion metrics of their ads. While Overture was the first in offering CPC advertising, Google managed to scale it up at massive levels. Before Google disrupted the advertising world and took over the digital advertising market, a few established publishers could make money via advertising. With its AdSense network, Google also allowed small publishers to monetize their content. In a way, it was a democratization of the digital advertising market, where anyone with the content that got the most eyeballs and attention could monetize on it, independently from its brand. Google AdSense is still an essential element of Google value proposition. The cash cow for Google is its AdWords network, made of a growing number of businesses looking to sponsor their products and services. That implies two things. First, Google needs to keep offering targeted ads that allow those businesses to generate leads. Second, Google is as worth as much as the qualified traffic it can generate. This implies that Google needs to keep focusing on making sure that users go back to its search results pages. Indeed, even if users do not pay for Google search results, they are the products. Offer the proper support to businesses part of the AdWords network requires a substantial investment in business development people able to expand the list of companies that join Google’s advertising network. This implies local initiatives, training, and support to those businesses. Internet users around the globe. Even though Google is a free service, Google‘s users are among the most important “customers.” If Google lost them, there would be no business at all. Those who are bringing big bucks to Google are agencies, marketers and businesses part of its Ad Network. They are driven by the fact that Google is an incredible source of targeted, and qualified traffic. AdSense Network Members allow Google to offer targeted ads on their web properties. It is important that Google keeps offering those publishers enough incentives to keep monetizing their content via the AdSense platform. I treat them here as “customers” because Google still needs to “convince” them to use the AdSense platform to monetize their content. Even though Google is a digital business, that might make you think the company has no real assets. This is far from the truth. As of 2017, Google had $7.2 billion of contractual obligations, primarily related to data center operations, digital media content licensing, and purchases of inventory. The most basic thing any sites with a large number of traffic needs is a massive server infrastructure. Back in the late 1990s when Google was still in the very initial stage at Stanford, it brought down its internet connection several times, by causing several outages. That allowed its founders to understand they needed to build up a solid infrastructure on top of their search tool. Today Google has a massive IT infrastructure made of various data centers around the world. Another element to allow Google to stay on top of his game is to keep innovating in the search industry. Maintaining, updating and innovating Google‘s algorithms isn’t inexpensive. Indeed, in 2017 Google spent over $16.6 billion in R&D, which represented 15% of its total revenues. The business model canvas is a model that helps you have an overall strategic vision of your business. It is comprised of nine building blocks. Those building blocks are critical to assessing your long-term strategy. Each of those blocks is not independent of each other. In fact, in many cases, they are strictly tied to each other. And from the interactions between them, you can build a sustainable business model able to unlock value for your organization and other players that are part of its growth. The business model canvas is a good starting point to assess your business or a competitors’ business. It is also a simple tool to leverage on if you need to design a sustainable and financially viable business model. However, that is not the only tool. Alternative tools for business model innovation and design comprise the lean startup canvas, the growth hacking canvas, Blitzscaling business model innovation canvas, and many others. The advantage of the lean startup canvas is the reduction in uncertainty and risk, as you start reiterating on a measuring whether the product or service delivered to your audience is a solution to their problems. You can track that by looking at key metrics. This model is well suited for those that want to grow a lean organization by limiting the risk of running a business based on too many assumptions and with an approach that is driven by your customers’ needs. The growth hacking canvas also built on top of the business model canvas and similar to the lean startup canvas, it has an additional layer in comparison to the latter as it allows to identify a set of actions to undertake to measure, assess and speed up growth. Growth marketing is a key ingredient for the success of any business in the current landscape. It is also the first move toward a 10X growth thinking for your business. A third tool, you can use for your business is called Blitzscaling business innovation canvas. I put together this framework after reading the book Blitzscaling. The Blitzscaling canvas aims to design an innovative business model to generate massive growth. More precisely Blitzscaling prioritizes on speed over efficiency and makes of massive growth its primary objective. Blitzscaling tells you that if you want to create a thriving business, you’ll need to leverage three key elements, the first being an innovative business model. This business model will need to be built around four growth factors (market size, distribution, high gross margins, network effects) and to avoid the to primary growth limiters (lack of product/market fit and operational scalability). Blitzcaling is well suited if you’re trying to scale a business and bring it to a billion-dollar business as quickly as possible! In short, what tool to use to design your business model will depend on what is that you’re after. In this guide, you have enough material to get going with your business! Significant article, every aspect clearly explained, will love to read more, thanks a lot!